Gift subscriptions harness the enthusiasm of your best, most loyal customers and lower your customer acquisition costs. Gift subscriptions, like refer-a-friend programs, have an inherent ‘social proof’ that recipients appreciate. Recurly offers two different gift types: cards and plans, which can be created and managed via Recurly’s direct interface (the UI) or our API. Both options are suited to B2C companies and provide a satisfying user experience for the giver and receiver, further supporting customer acquisition goals. Recurly gift cards are ideal for B2C merchants who sell digital goods and have a number of different plans, necessitating flexibility for the receiver in choosing their gift. Gift cards provide this flexibility along with other benefits. If the recipient becomes a paying subscriber, they too may give gift subscriptions, bringing in even more new subscribers! 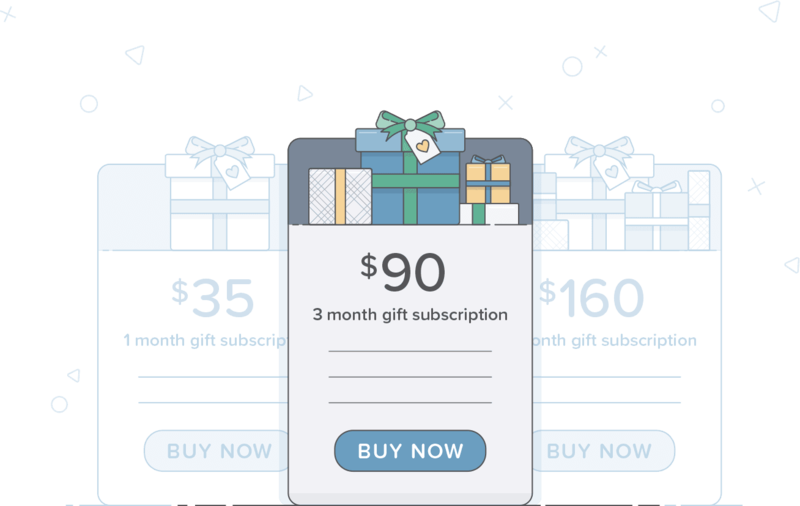 Recurly also offers gift plans which, similar to gift cards, leverage a subscription business’ ‘raving fans’ and help it to acquire new subscribers at a lower acquisition cost. Gift plans are suited to businesses that ship physical goods because the plan starts upon purchase, so shipping can be immediate rather than waiting for the recipient to redeem a gift card. Gift plans are also suited to businesses which have only a small number of plans, so they don’t need the flexible purchasing options provided by gift cards.